Cranbury Road (CR615) in West Windsor. Note the complete lack of sidewalks or bike facilities in the current condition. (via Bing Maps, click to expand). 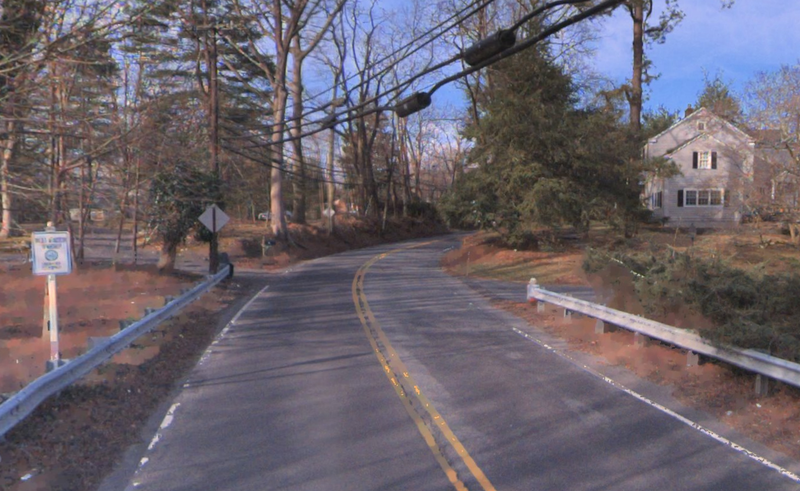 West Windsor Township has been having a big public discussion recently about improving Cranbury Road, which is Mercer County Road 615. This discussion has been brought about by a brave and organized bunch of local residents, who are determined to see safety improvements. They persuaded the West Windsor authorities to commission a report to see what design alternatives could work to add safe walking and cycling facilities along CR615 in West Windsor. The report was subsequently published, outlining a number of different alternatives, which would have provided different amenities, and carried different costs in terms of both money and right-of-way. Several of the options included bike lanes, which would be a great option for cyclists to give them safe space away from the large volume of traffic which rushes along CR615. But the final recommended plan, the so-called ‘hybrid alternative‘ contains no facilities for cyclists at all. It does contain sidewalks, which is a big step forward, but the ‘Complete Streets’ policy adopted by both West Windsor and Mercer County calls for streets to be made safe for all users, not just certain groups. The ‘hybrid alternative’ seems to completely miss the mark for cyclists. This is really, really, really, really, disappointing, because West Windsor is usually very progressive when it comes to accommodating cyclists. It was a ‘bike-friendly community’ long before Princeton, and West Windsor is home to a great number of advocates who have pushed for better bicycle facilities. West Windsor, and Mercer County promised to do better than this, and local residents deserve better than this. Below is my letter to West Windsor engineer, Brian Aronson, who has requested feedback on the Cranbury Road plan through the end of today, Friday, November 7. As a Princeton resident, I’m a little reluctant to be commenting on something that is happening in West Windsor, but this is a Mercer County road that is paid for by all of us, and intended to support all our transportation requirements. The last generation dumped us with a bunch of bike-unfriendly roads, which make car use seem essential to many people. The least we can do is try to design roads that are safe for everybody in the next generation. If you want to send Mr Aronson your own message, his email can be found at this page on the West Windsor Township homepage. I examined with interest the proposed ‘hybrid concept’ for CR615 (Cranbury Road) in West Windsor. As you are no doubt aware, Mercer County and West Windsor have adopted Complete Streets policies, requiring that road designs should be accommodating to safe use by all users, including pedestrians, cyclists, transit users, and motorists. The proposed ‘hybrid plan’ for CR615 is a step forward in that it provides sidewalks for pedestrians. On the other hand, this plan has no safe accommodations for cyclists. As such, it is not compliant with Complete Streets, or previous motions passed by WW Township envisaging safe accommodations for cyclists traveling between the Township and Plainsboro. This is very disappointing, because Cranbury Road is presently a hazardous place to cycle. The public discussion on Cranbury Road included consideration of plans that would have provided proper cycle facilities. These plans appear to have been discarded in spite of the Township and Mercer County’s stated adherence to the principles of Complete Streets. This entry was posted in Alternative Transportation, Complete Streets, Local, planning, Sustainability and tagged Complete streets, Princeton, West Windsor. Bookmark the permalink. Oh where to begin. Let’s see, have you ever cycled west on Cranbury Road from Grovers Mill? Give it a shot. Curvy, blind corners, and a sharp uphill. And where would you be coming from? Another uphill further down Cranbury rd toward Cranbury Township? It’s not very densely populated out that way, so a bike path is a big investment for something that would get scarcely used. The densely populated parts of Plainsboro are too far to bike to Princeton Jct train station. Its a 12-15 minute drive, and on bike, it would be close to 25, even if you take the short route of about 4 miles. Now, Cranbury road could surely use walkways, because it is only a matter of time before one of the brave souls that walks there now gets hit. I honestly can’t believe it hasnt happened (or at least I havent heard that it has.) The issue with the bike path is that a walkway takes precedence, and if you put in a walkway, (again, ever SEE the road?) you are already talking about a major undertaking of tree removal, widening, etc, and there just isnt that much space to work with there. Once a walkway is in, where would you fit a bikepath of any meaningful size on a road that is already cramped for two cars? Anyone that thinks to bike that section of road (between MIllstone and rt 571) could easily just take Clarksville, and go a tiny bit out of there way and through much safer streets, including the old Berrien Village development to get to the station. A bike lane on Clarksville would be a piece of cake. I have ridden on Cranbury, and I agree it is dangerous. That’s why it should be made safe for all users. It’s not true that Plainsboro is too far from PJ to bike. It’s an 18 -min, 3-mile bike ride from Fox Run Drive, where I used to live, to the rail station by the most direct route, which is – of course- via Cranbury Road. Lots of people would cycle it if it was safer, which is why it is worth doing the job right. I’m all for it if it can be done reasonably and will get sufficient usage. I dont know the additional cost of going from walk lane to walk + bike, but it’s probably not that much, so if you are going to do the walk, and can do the bike, it makes sense to do it most likely. Im not sure, however, that Id want to encourage bikes on that road, even with a bike lane, given the nature of the road and behavior of drivers. You recall the 25 mph signs there Im sure. It wasnt because people were going to slow. That said, no one is forcing anyone to bike, so it’s fine for people to make the choice themselves whether to take that route. If they feel it is too dangerous, they can avoid it. Although that brings up the issue of the intersection of Millstone Rd and Cranbury, which is not something Id want to navigate on a bike if coming from Plainsboro and going to Clarksville Rd. As for the distance from Plainsboro issue, yes, from the near parts of Plainsboro it might be just doable. I know the typical commute has to be under 30 minutes, but I dont know how bike people feel about what is reasonable. Plainsboro to PJct has a series of uphills, which will make it slower, but I suppose that would make the ride home nice. The analysis and hybrid plan show a real lack of imagination and limited us of contemporary bike infra tools. Bike lanes could have been used on the up hills and sharrows on the downhill where constraints limit project width. This is a critical connection that I’ve ridden and would like to see made safer. I’d also argue that a bike lanes would actually get more use and provide greater utility. I really wonder about the need for sidewalks in the southeastern part of the roadway that is almost rural in character. The road could have at least been given shoulders here (hard to tell of the hybrid plan calls for them).